Denise R. Vaughn, age 64, of Sullivan, Missouri, passed away Monday, March 4, 2019 at SSM Health St. Clare Hospital – Fenton. Denise O’shea was born on November 25, 1954 in St. Louis, Missouri, the daughter of George Raymond O’shea and Marlene Joyce Peters. She was united in marriage to Floyd E. Vaughn on September 17, 1994. Denise was very loved by all of the Vaughn family. 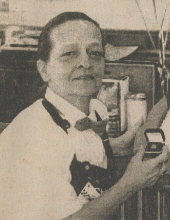 She was employed by Sullivan Steak ‘N Shake on April 14, 1997 and she worked for them for 17 years. Anything Elvis will always remind her family of her. She is and will always be greatly loved and missed. Denise was a loving wife, mother, grandmother, great-grandmother, sister, aunt and great aunt. Denise is survived by her husband, Floyd Vaughn of Sullivan, MO; two children, Desiree Rea Humbolt of Cedar Hill, MO, and Darius William Dossinger of St. Louis, MO; stepson, Floyd Allen Vaughn, Jr. and wife, Tammy, of Sullivan, MO; grandson, Donny James Humbolt; 2 great grandchildren, Owen James Humbolt & Ella Bell Humbolt; 3 sisters, Cynthia Spradling, Natalie Brinkley, and Marlene McCue; one brother, Paul Brawley; 3 brothers-in-law, Bradford Allen Vaughn, Ricky Dennis Vaughn, and Perry Mitchel Vaughn; sister-in-law, Teddy Byard; Christena Hazeton and family; many nieces and nephews; other relatives and friends. She preceded in death by her parents, George Raymond O’shea and Marlene Joyce Peters. It was Denise’s wish to be cremated. No services were held. To send flowers or a remembrance gift to the family of Denise R. Vaughn, please visit our Tribute Store. "Email Address" would like to share the life celebration of Denise R. Vaughn. Click on the "link" to go to share a favorite memory or leave a condolence message for the family.